Var (Balsam Fir) is the most common species in Newfoundland and grows best in moist well-drained soils. 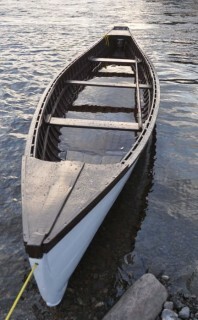 As a strong and light softwood, fir was once preferred for planking a Gander Bay Boat but its susceptibility to insect attacks has damaged the quality of timber. As a result, many builders have been forced to switch to spruce as an alternative. Spruce is a relatively light softwood that has become the preferred timber for the plank, stem, sternpost and keel in a Gander River Boat since fir populations have been damaged by invasive insects. Cotton string is preferred for sealing the planks in a Gander River Boat, but local builders find it increasingly difficult to find. Some builders have turned to using an ordinary house mop as a substitute. Once taken apart, the individual strand are inserted between planks using a caulking iron and mallet. Gander River boats are always painted brown and white. White is selected for the exterior hull because it is the best colour for the wood when the boat is turned over on the shore. The light colour paint absorbs less sunlight and the wood does not dry out as quickly. If the boat is left upright out of the water, the wood will dry and shrink and once she’s placed back in the water she will be leaky. After some time back in the water, the wood will plim (swell) and the seams will reseal. When the motor was removed from this Gander River Boat, the boat became leaky above her waterline. To reseal the seams, the owner filled the boat with water and left it overnight for the wood to plim. Love the site and info. I have used the Gander for nice while now. One of the boat my brother and I have is 22 years old and still working the gander river. I have always bought my boat used from the guides and now think I would like to try build my first. I have the mold and timbers but would like a good set of drawing. Could you please help. Hi Kirk, we’ll be in touch with you soon via email. Hi, I love your site. I am a carpenter but never built a boat. For the last 11 years I have been fishing the Gander River with a friend who owns a Gander River Boat. The past three years I have been learning the River. I would love to build a Gander River Boat, could you send me the drawings, and more information on building the molds? I have a steamer made for making sled runners, skis, and chairs. Would love to build a Gander River Boat this winter. I appreciate any helpful advice you could offer. Thanks very much.